In order to get selected in any interview must have knowledge about the type of question asked in the most interview and you need to practice your responses to a number of interview questions. While attending the interview you must answer questions asked by interviewer very appropriately and confidently, it should sound like memorized, it should sound natural and confident. All the questions asked by the interviewer depend upon selection criteria and position description. Questions are selected to test your eligibility for the job position. To improve your preparation for your interview preparation we provided the most asked questions in the interview by an interviewer with their best answers, so that you enhance your interview preparation and you are able to respond appropriately. If you hire me, it will be a great platform to showcase my skills. Whatever goals I set, I ensure to complete them within a stipulated time. The reason behind leaving your last job? I enrolled myself for some advanced personality development course with some freelance work. Tell me your ability to work under pressure? I keep myself calm and focus on multitasking while being patient. I will be constantly keeping tab of assigned work with my subordinates and seniors, ﬁnishing the assigned job before deadlines. Yes, The team which I was a part of have successfully completed the projects within deadlines. I believe in teamwork. Even if I find anything irritating, I try to avoid it unless it personally affects me. I see myself in a senior position managing an important portfolio of this company. It doesn’t matter till I learn something new in every project. It seems like an easy interview question. It’s open-ended. I can talk about Whatever. Right? - What the hiring manager really wants is a quick, two- to a three-minute snapshot of who you are and why you’re the best candidate for this position. - Use an example or two to back it up. Always point back to an example when you have the opportunity. - "Tell me about yourself" does not mean tell me everything. Just tell me what makes you the best. - I'm really energetic. and a great communicator. Working in sales for two years helped me to build confidence and taught me the importance of customer loyalty. - I am punctual. dependable and can be counted upon to ﬁnish what I start. - I understand my customers' needs. - I consider myself hardworking / reliable/dependable / helpful /outgoing /organized/honest/ cooperative. - The easy answer is that you are the best person for the job. And don’t be afraid to say so. But then back it up with What specifically differentiates you. - For example: “You should hire me because I am the most suitable person for this job. I realize that there are other candidates who also have the ability to do this Job. Yet I bring an additional quality that makes me the best person for the Job -- my passion for excellence, strong analytical and problem-solving ability. I am passionately committed to producing truly world class results. running within a couple of weeks. - You require someone who can perform a wide range of administrative duties. I have a track record of carrying out these different tasks efﬁciently and successfully. - I have the right combination of skills and experience for this job, I also bring the additional quality of strong analytical and problem-solving ability as shown by my introduction of a more efﬁcient workflow system at ABC Company. Show it by your passionate examples. Tell me about a difficult situation you have faced? - In my last job I sometimes had to ﬁnd answers to IT questions. I would often go on the Internet and look for blogs on the topic I needed to learn about. I enjoy learning new things no research is actually one of my hobbies. - I have faced a number of difﬁcult situations, but the one that comes to mind now is.. (describe the situation). I was able to deal with it by assessing the situation. determining the possible different approaches and deciding on the most effective one. I had to remain unemotional and objective and focused on a solution. I'm a perfectionist and I may be too hard on myself or my co-workers sometimes. - I've never been very comfortable with public speaking which as you know, can be a hindrance in the workplace. Realizing this was a problem. asked my previous employer if I could enroll in a speech workshop. He said "yes." I took the class and was able to overcome my lifelong fear. Since then, I've given lots of presentations to audiences of over 100 high-level executives. I still don't love it. but no one else can tell! - I have had trouble in the past with planning and prioritization. However, I'm now taking steps to correct this. I just started using a pocket planner. - I might need to learn to be more flexible when things are not going according to plan. This is something I'm working on at the moment. - I believe my strongest trait is my attention to detail. This trait has helped me tremendously in this ﬁeld of work. - I've always been a great team player. I'm good at keeping a team together and producing quality work in a team environment. - I'm an adaptable person. I work for three different managers. They have very different management styles and expectations of me. I am able to adjust my approach to meet each of their needs. What do you find most rewarding about being in sales (marketing, HR and so on)? - I really enjoy making contacts and spending time talking with people. The most rewarding part of being in sales for me is the time spent with customers, helping them make the right decision about a product. - I‘m a people person I was always happiest and most satisﬁed when I was interacting with customers. Making sure I was able to meet their needs and giving them the best possible customer experience. - I'd like to stay in a ﬁeld related to training no matter what happens. I was too interested in business to work at a university but I believe that teaching is somehow in my blood. - I've been good at sales because I took the time to educate my clients. Now I look forward to training the new hires. - My work is important to me, so instead of rushing to accept the ﬁrst thing that comes my way, I'm taking my time and being selective to make sure my next role is the right one. - I am working on several freelance projects, while actively job seeking. - I'm spending time being a stay-at-home mom and volunteering at my daughter's school. I'm taking some continuing education classes and seminars. - I've learned a lot from my current role, but now I‘m looking for a new challenge to broaden my horizons and to gain a new skill-set - all of which I see the potential for in this job. - I‘m looking forward to a better opportunity to grow in job wise and financial wise. - I want to learn more things where am working. - I‘m looking for a job where I can grow with the company. - I'm looking for a job that suits my qualiﬁcations. - I was laid off/ made redundant because the company relocated/downsized/needed to cut costs. - The key is to focus on your achievable objectives and what you are doing to reach those objectives. - For example: “Within five years, I would like to become the very best engineer your company has on staff. I want to work toward becoming the expert that others rely upon. And in doing so, I feel I’ll be fully prepared to take on any greater responsibilities Which might be presented in the long term. For example, here is What I’m presently doing to prepare myself. - Then go on to show by your examples what you are doing to reach your goals and objectives. - This is a broad question and you need to focus on the behavioral examples in your educational background which specifically align to the required competencies for the career. - For example: “My education has focused on not only the learning the fundamentals but also on the practical application of the information learned within those classes. For example, I played a lead role in a class project where we gathered and analyzed best practice data from this industry. Let me tell you more about the results...."
- Focus on behavioral examples so porting the key competencies for the career. Then ask they would like to hear more examples. - Almost everyone says yes to this question. But it is not Just a yes or no question. You need to provide behavioral examples to back up your answer. - Emphasize teamwork behavioral example and focus on your openness to the diversity of backgrounds. Talk about the strength of the team above the individual And not that this question may be used as a lead into questions around how you handle conﬂict within a team, so be prepared. Have You Ever Had A Conflict With A Senior Or Professor? How Was It Resolved? 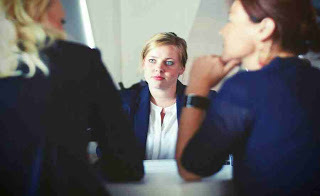 - Note that if you say no, most interviewers will keep drilling deeper to find a conﬂict. The key is how you behaviorally reacted to conﬂict and What you did to resolve it. - Focus your answer on the behavioral process for resolving the conﬂict and working collaboratively. What Is Your, Greatest Weakness? - Most career books tell you to select strength and present it as a weakness. Such as: “I work too much. I just work and work and work”. First of all, using strength and presenting it as a weakness is deceiving. Second, it misses the point of the question. - You should select a weakness that you have been actively working to overcome. For example: "I have had trouble in the past with prioritization. However, I’m now taking steps to correct this. I just started using a pocket planner . . ." then explain them your planner and how you are using it. - Talk about a true weakness and show what you are doing to overcome it. - This is a threat of reference check question do not wait for the interview to know the answer. Ask your professors in advance. And if they’re willing to provide a positive reference, ask them for a letter of recommendation. - So be prepared in advance (with your letters of recommendation, if possible). What Qualities Do You Feel A Successful Manager/Engineer Should Have? - Here is a sample of how to respond: “The key quality in a successful manager should be leadership-the ability to be the visionary for the people who are working under them. The person who can set the course and direction for subordinates The highest calling of a true leader is inspiring others to reach the highest of their abilities. I'd like to tell you about a person whom I consider to be a true leader. - Then give an example of someone who has touched your life and how their impact has helped in your personal development. - Focus on a key turning point in your life or missed opportunity. Yet also tie it forward to what you are doing to still seek to make that change. - Stay focused on the positive direction of in your life and back it up with examples. Where Do You See Yourself In 3-5 Years From Now? consultant. I believe that my abilities will allow me to excel to the point that I can seek other opportunities as a portfolio manager (the next step) and possibly even higher. - In five years I see myself as a valued employee of a company. I want to be an expert at my position and start training to be a manager. - My goal is to become a leader in five years. Although not everyone gets promoted to this level. I believe I can achieve this goal through hard work.